Acne is a broad term that encompasses a variety of skin ailments. It’s a condition that involves much more than an occasional pimple or zit. 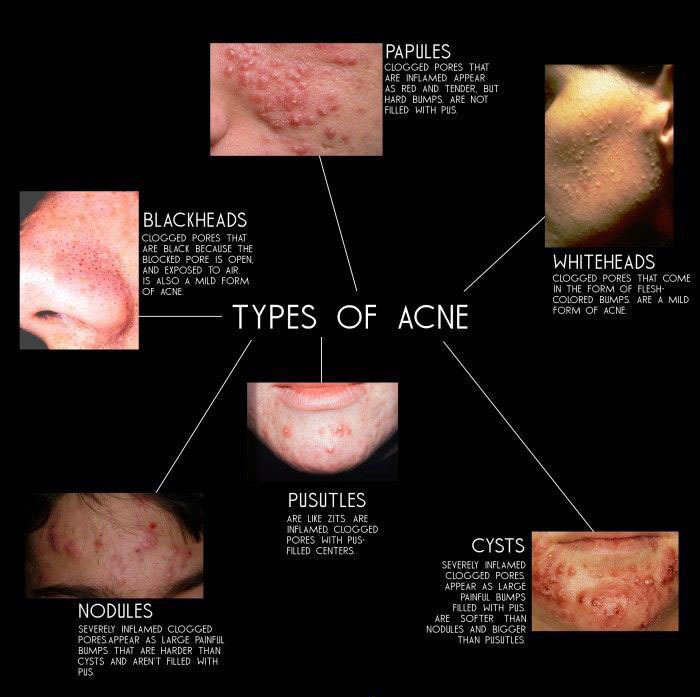 Acne comes in varying severity and it affects everyone differently. In order to successfully treat your acne, it’s essential to recognize and diagnose the different acne types you are struggling with (you may have more than one). Bear with us, these aren’t the nicest names or descriptions. 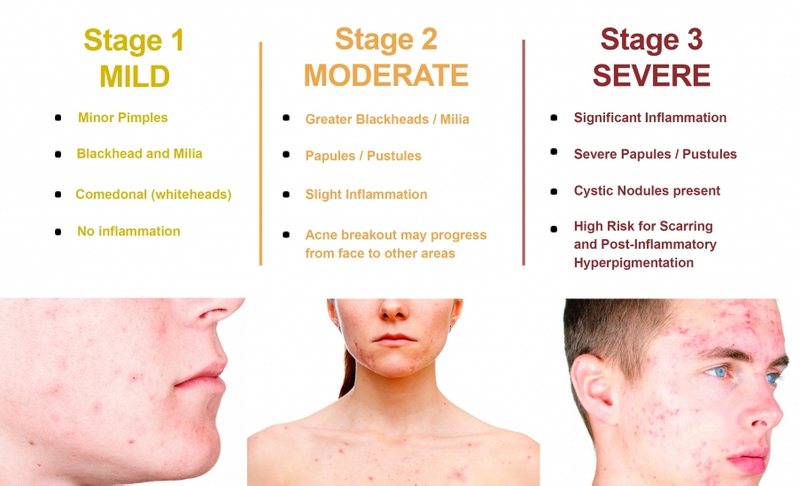 Types of Acne — What Type of Acne Do I have? Beyond Acne Vulgaris, there are different kinds of acne conditions, including Acne Fulminans and Acne Mechanica. 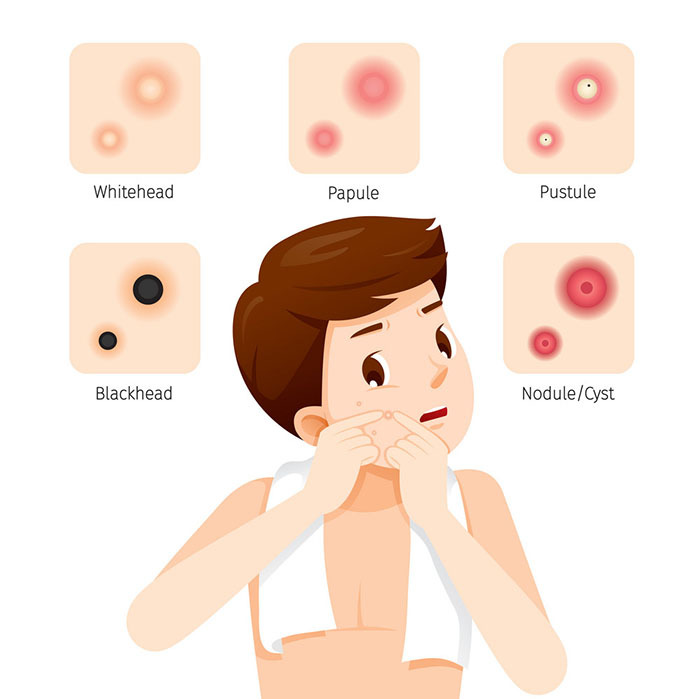 Acne Fulminans: This is a rare but very severe form of acne that comes on abruptly in adolescent male, characterized by inflammatory nodular acne on both the chest and back. It can result in severe scarring and painful joints, along with other health issues. Acne Mechanica: This form of acne is triggered by excess pressure, heat, and friction on the skin, and is often found among athletes and those already prone to acne breakouts. It’s characterized by small bumps that can range from tiny comedones to inflamed lesions. Acne is the emergence of infected or inflamed sebaceous glands in the skin. Acne Vulgaris—the medical name for common acne—forms when hair follicles become clogged with excess sebum, bacteria, and dead skin cells. This results in a comedo, also known as a clogged pore. 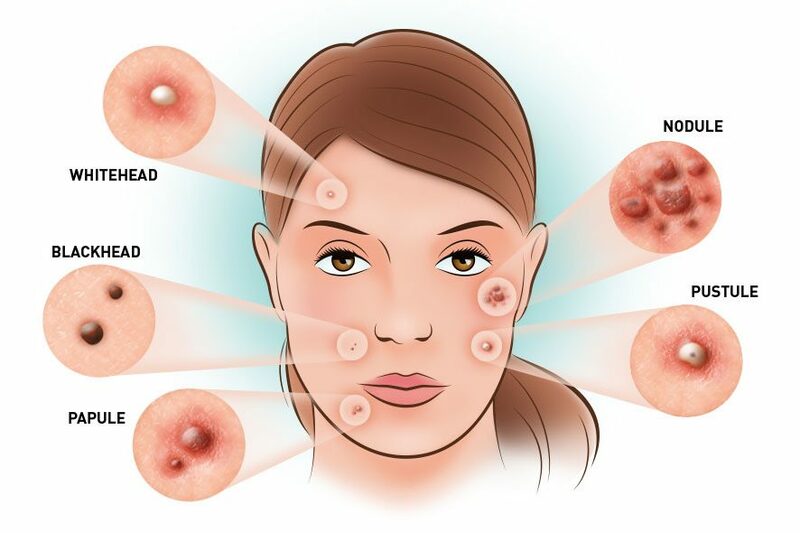 Acne Vulgaris can be commonly found on the face, back, and chest, as these areas of the body tends to be saturated with pilosebaceous units, but may be found on other areas such as your booty. As skin cells regenerate, old cells slough off and. If these dead skin cells aren’t flushed from the pores and manage to combine with sweat and oil, they’ll be trapped and result in the formation of a pimple. Our pores are connected to a system of oil glands directly beneath the skin. Within these oil glands, sebum is produced. This substance is meant to keep our skin moisturized and healthy, but excessive production of this oil can lead to acne; as oil is pushed through the follicle, should it attach to dead skin cells or a bacteria, it can clog the pore and create a plug in the skin. Sebum will continue to build up behind the plug, resulting in a comedo that may turn into one pimple. There’s a plethora of myths about the causes of different types of acne, many of which are untrue and baseless. You might have been told to wash your face more, or cut down on your chocolate-eating habits, perhaps even told to get some more sun for your skin condition. None of these common acne myths are true. Poor hygiene doesn’t cause acne, chocolate won’t make you break out, and sun exposure can actually damage your skin and make breakouts worse. Acne is caused mainly by genetics and hormones, and there are many factors that can exacerbate this skin condition. Acne Vulgaris generally develops during the teen years, when the onset of puberty causes the hormonal level to fluctuate. As hormone levels rise, especially testosterone, the skin glands begin producing larger amounts of sebum. What causes oily skin? Sebum, which can lead directly to acne bumps or breakouts. Puberty isn’t the only time we experience hormonal changes. Women experience regular variations in hormone levels, specifically that of estrogen and androgen. Men also experience hormone level fluctuations, especially in their teens, but this usually mellows out by adulthood. Acne is also a result of hereditary factors. Children whose parents have dealt with acne are more likely to struggle with this skin condition. While it’s not a genetic disease, hereditary components have been linked to the presence of this skin condition. Genetics have a huge bearing on how your immune system works; say two individuals experience the same bacterial infection. One might react with painful, pus-filled nodules, while another’s skin may only result in the formation of blackheads. Similarly, one person may have more sensitive skin that grows raw and inflamed more often due to their genetic predispositions. Ever asked yourself: Why do I have dry skin? Family history can have a lot to do with the way your skin looks and feels, and is usually a good indication of whether or not an individual will deal with acne breakouts. While stress doesn’t directly cause acne, it can trigger or exacerbate a breakout. We see this occur in students across the globe when they’re handling stress during finals. When you’re stressed, your body releases cortisol and androgens. When these hormones fluctuate, your skin secretes more oil, which can bring on a breakout or worsen pre-existing pimples. If you find that your skin is particularly sensitive, be sure to integrate healthy skin care tips to counteract the inevitable stress in your life. Acne is typically categorized into two main types: non-inflammatory and inflammatory acne. Although there are two primary categories, there are many different types of acne which we’ll discover later on. Non-inflammatory acne is characterized by comedones, which can be open or closed. These comedones are more commonly known as whiteheads and blackhead and are generally referred to as different types of pimples. If the pore stays open on the surface of your skin, it’s considered an open comedo, also known as a blackhead. Because the pore is open, the sebum inside the pore oxidizes upon contact with the air; this hardens the sebum, and once the air mixes with melanin skin pigment, the blackhead forms a dark coloration that can appear black, brown, or gray. 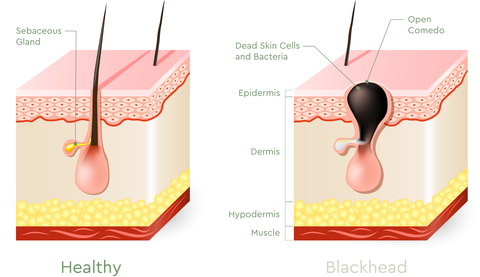 Blackheads can usually be found on the nose, chin, and forehead, but might also be found on the chest, back, and arms. Blackheads tend to be rampant at the onset of puberty and during times of hormonal change. If a pore is not open and covered by a thin layer of skin, sebum and dead skin cells accumulate, resulting in a thick substance that remains stuck under the skin, forming a plug. While these are not usually infected, bacteria can affect the skin cells surrounding the pore. Whiteheads don’t usually last as long as blackheads, with an average cycle of a week. Whiteheads tend to be found on the face, but may also be observed on other parts of the body. Self-extraction of comedones can cause more harm than good. 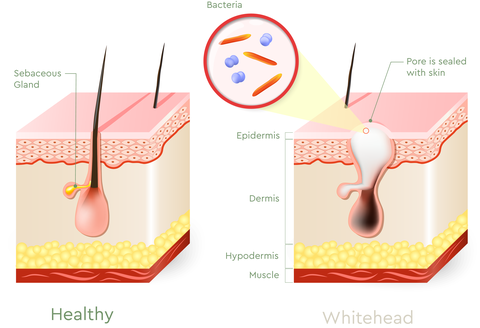 The follicle walls in blackheads and whiteheads can be ruptured quite easily, and this rupture allows bacteria to enter the cells and leads to inflamed acne. That’s why it’s essential to avoid picking the skin, as this can lead to rupturing. Papules are small, raised, solid pimples that don’t contain pus and are usually the first type of inflammatory acne to affect the skin. Papules don’t display a visible pore and tend to be red in color and surrounded by swollen and inflamed tissue. They may be tender to the touch. Pustules are pimples that are noticeably white or yellow in the middle and are filled with pus. 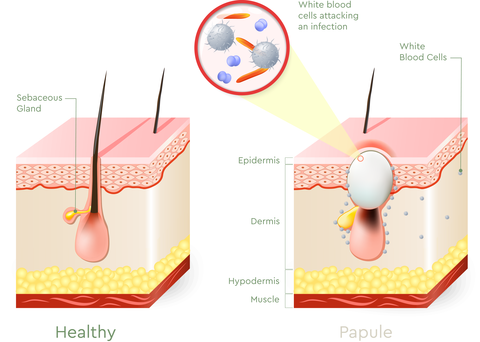 The marked difference between papules and pustules is that pustules contain white blood cells. When your immune system attempts to fight bacteria that’s made its way into a ruptured follicle, it will set off a buildup of white blood cells, resulting in pus production. The skin around pustules tends to be tender and inflamed. 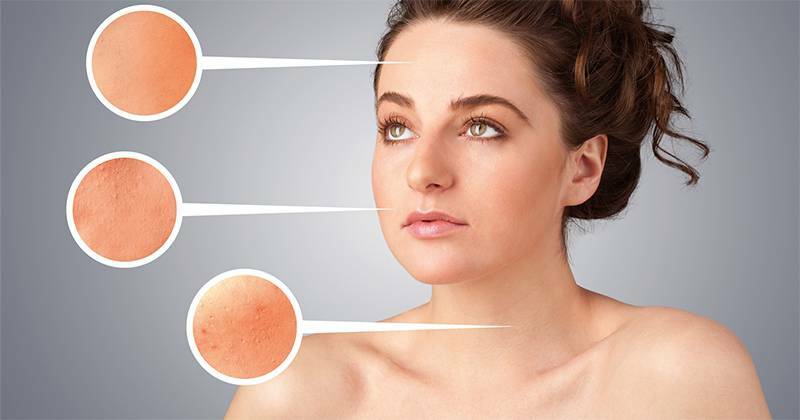 Acne nodules appear during the latter stages of a breakout and are usually seen in severe cases of acne. They present as large, tender bumps underneath the skin’s surface and can feel hard and stiff to the touch. Similarly to papules, nodules form from a buildup of bacteria, skin cells, and sebum in the follicles, but this formation is rooted deeper in the skin. This deep buildup can cause tissue damage to the skin and prompt the immune system to begin an inflammatory response. While they look similar to papules, nodules are much bigger and more painful. They do not contain any pus, but can remain buried within the skin for a long time. They may be dormant and rear up in occasional bouts. If squeezed or ruptured, these nodules can spread over a larger area of the skin and cause deep infections. These lesions can cause damaging and permanent scars to the skin. Cystic acne is one of the hardest types of acne to successfully treat. Unlike pimples, acne cysts form deep below your skin tissue and do not come to a head. Cysts are similar to nodules, except for the presence of pus. Cysts are almost always painful to the touch and can cause great discomfort, and they don’t necessarily look like a pimple. They may just appear as a large, swollen, and red lump on the skin. They may occur independently, or you may find your skin has large clumps of cysts grouped together. Cystic acne is less prevalent; where general acne affects 70 out of 1,000 people, cystic acne affects 2 in every 1,000 people according to Medical News Today. This severe form of Acne Vulgaris usually requires the help of a dermatologist in conjunction with self-care and preventative measures. Inflammatory acne takes much longer to heal and can have permanent effects on the skin, so it’s important to determine the best treatment methods for your skin condition. If you’ve noticed a plethora of small grayish dots appearing across your face, especially on your nose or chin, you might incorrectly label them as blackheads. Those are actually not blackheads, they are what’s known as sebaceous filaments. These are naturally occurring hair-like formations that follow the flow of oil along the inside of a pore. If you have oily skin or larger pores, they’re more noticeable. These become visible as a pore is filled with sebum. While blackheads also begin as pores filled with sebum, it’s only once a pore is plugged with dead skin cells that it becomes an actual comedo. It’s easy to see the difference between blackheads and sebaceous filaments when it comes to extraction. When extracted, a blackhead has a dark, hardened, plug-like appearance. Sebaceous filaments are expelled in a flowing stream of sebum that takes on a waxy consistency. You can also observe a difference in the colors of these lesions; a blackhead will be quite dark on the surface of your skin, where sebaceous filaments may be yellow-tinged, gray, or take on the hue of surrounding skin. Even when these filaments are extracted, they generally refill with sebum within 30 days. There’s no way to completely rid the skin of these sebaceous filaments, but keeping your face clean with a regimen of regularly treating acne can help minimize their appearance and keep those pores cleaned out. When it comes to acne diagnoses, Acne Vulgaris is measured on grades of severity, and can be diagnosed in four different classifications. Patients diagnosed with Grade I acne generally exhibit mild forms of this skin condition. Their skin may have whiteheads, blackheads, and small pimples. There’s not usually inflammation present with this type of acne breakout, and mild cases like these can often be self-diagnosed. Usually, this type of breakout occurs on the nose and forehead and most often appears in adolescence. Adults may also experience this type of acne, usually with blackheads on the nose or forehead. 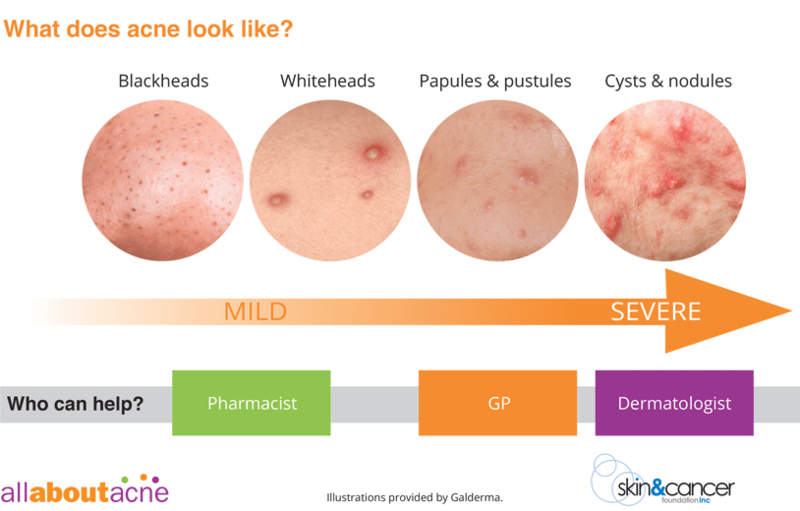 Moderate acne falls under a Grade II severity qualification. Those with this grade of acne will likely exhibit a plethora of comedones on the skin. There will be more frequent breakouts, likely accompanied by pustules and papules that may be more sensitive to the touch. This grade of acne is accompanied by a large amount of inflammation in comparison to the lesser grades. The skin will exhibit numerous papules and pustules, and there may be nodules present. This is the most severe form of acne, and will see skin filled with nodules, cysts, pustules, and papules. With this severity grade, acne tends to be spread across more than just the face; the back, chest, neck, and buttocks may also experience frequent breakouts. Acne of this severity can cause significant scarring and may disfigure the skin if left untreated. According to the American Academy of Dermatology, oral isotretinoin is the only medication approved to treat severe cystic acne. It’s important to seek out a dermatologist’s advice if you believe your acne is severe. The more severe the grade of your condition, the higher the risk of permanent skin damage, so it’s essential to secure the best treatment and take preventative measures to circumvent this. No matter the severity or type, individuals dealing with any type of acne breakout and other skin conditions often struggle with emotional effects as a result. For teenagers early in their social development, skin ailments such as acne can cause self-esteem issues and in severe cases, depression. Even with the best young adult acne treatment put to use, acne breakouts and scarring can mar a young person’s self-image as physical appearance becomes important to feelings of self-worth. The threat of emotional damage doesn’t stop in adolescence, however. Adults who deal with different kinds of acne can also face negative emotional impact as a direct result of their skin condition. One study performed by the Indian Journal of Dermatology found that adult females with mild to moderate acne experienced higher levels of emotional and social impairment. Whether you deal with the occasion blackhead or have been experiencing severe and painful breakouts, acne is a daily struggle for many in the United States, with millions across the country struggling with this painful skin condition. When acne flares, causing physical discomfort and pain and negative psychosocial effects, treatment is vital. Be sure you know how to figure out your skin type as this understanding can aid you in any treatment you pursue. Narrowing in on the acne types you struggle with will enable you to select an effective treatment that clears your skin and prevents future breakouts. Acne can cause significant negative psychological effects. Sebaceous filaments are often mistaken for the presence of blackheads. Dermatologists diagnose Acne Vulgaris in four grades of severity, ranging from mild to severe. There are more severe skin conditions that are commonly mistaken for common Acne Vulgaris, including Acne Fulminans, Pyoderma Faciale, and more. Left untreated, acne can leave permanent scars, so it’s essential to begin treatment as soon as possible.